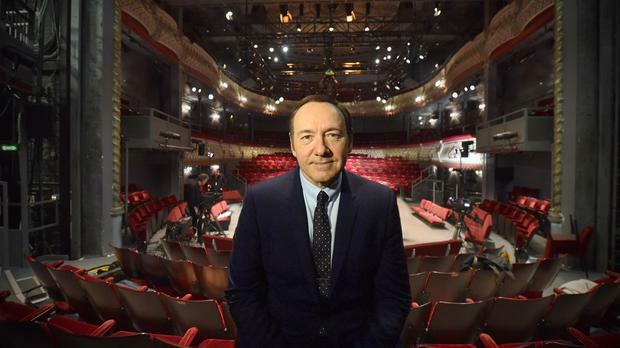 The extraordinary impact Kevin Spacey has had on British theatre was clear when he was honoured at a gala ceremony celebrating his tenure as artistic director of London's Old Vic theatre. Stars of stage and screen, many of whom worked with him as he dragged the theatre off its knees to once again become one of the country's finest, turned out to pay tribute to his tenacity and hard work. Spacey, 55, who became the Old Vic's director in 2003, was hailed as an " extraordinarily charming schmoozer", " as scary as Lux Luthor" and a "consummate actor" by friends and colleagues alike. During his 12 years at the helm of the Old Vic, Spacey has directed two productions and starred in nine, including a worldwide tour of Shakespeare's Richard III. But it was his efforts to rescue the theatre from ruin and transform it into a world-famous stage with an education programme that touched young people in one of the capital's most deprived boroughs that also earned him high esteem. Downton Abbey's Hugh Bonneville hosted the gala, which featured performances from musician Sting, Sherlock writer Mark Gatiss and Spooks and Hustle actor Robert Glenister among others. Gatiss, who starred with Dame Diana Rigg in All About My Mother at the Old Vic, said Spacey's departure, marked "the end of an era". Recalling his time in the play as "the most brilliant three or four months I have ever had", he said praised Spacey for transforming the theatre into a "real beacon". He added: "He leaves the Old Vic in an incredibly healthy state. He had that amazing energy, an incredible amount of Hollywood glamour, but also that brilliant, very 'new world' sort of attitude of 'we can do it'. I think he has done a fantastic job." Bonneville, who starred in Spacey's first production as artistic director in 2004, the play Cloaca, was also full of praise. He said: "He is very scary and is as funny as you can imagine. He is Lex Luthor, he is funny, and he is as consummate actor and he just loves the theatre." Neil Pearson, who also appeared in the production of Cloaca, recalled Spacey's resilience after the show was slated by critics. He said: "It was almost his last show, I think, but for his extraordinary tenacity and 'screw you' attitude. Most people would have scarpered." It was this attitude which helped him turn a building that was "probably two weeks away from being a car park" into a "major theatrical landmark in London". Complimenting Spacey as a "great fundraiser, manager, politician" and an "extraordinarily charming schmoozer", Pearson added: "He has got two Oscars but he has always been at heart a theatre man, a company man. "He is very much an alpha-male within a company, but this is where he lives. "For all his success as a film actor, if you pressed him I think he would say that theatre is his first love." Spacey, who also stars in TV show House Of Cards, was honoured with a special Olivier award last weekend by Dame Judi Dench in recognition of his stint at the theatre.